Fewer things can have such a negative impact on our confidence than that of thinning hair. A thick, flowing and shiny hair style is associated with youth and vitality – so it’s no surprise it’s what we all continually strive towards, and spend millions of pounds trying to achieve every single year. Although you can suffer with thin and weak hair at any point in your life, it’s increasingly common as we age and our bodies are no longer able to perform at their best; with so much focus placed on keeping our organs working and our limbs moving, the hair is unfortunately one of the first things to take a back seat. A sparse hair line or limp and lifeless locks can have a significant negative impact on our confidence and self-worth, but you don’t have to ignore the symptoms and resign yourself to a life not lived to the full (in the hair sense.) There are solutions that have been designed to help and are scientifically proven to make a difference: one of which is TRX2. 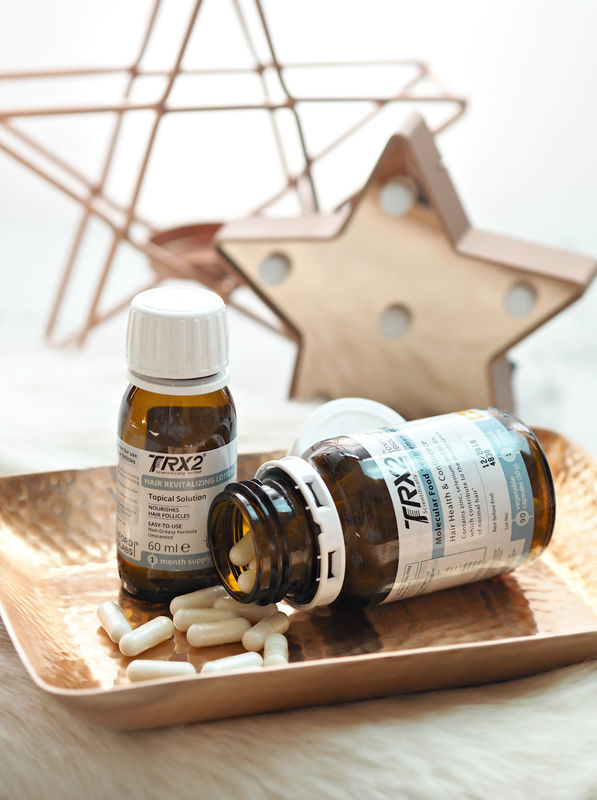 Created with the expertise of Oxford Biolabs scientists, TRX2 is a natural hair loss supplement providing scientifically-proven support for anyone suffering from the confidence draining effects of hair thinning. Hair loss can be caused by a number of factors, including genetics, hormones and diet; TRX2 is a hair thinning treatment specifically designed for those suffering from the early stages of hair loss and consists of natural substances that our body normally produces at sufficient levels in healthy hair, but at insufficient quantities in those who experience hair thinning. 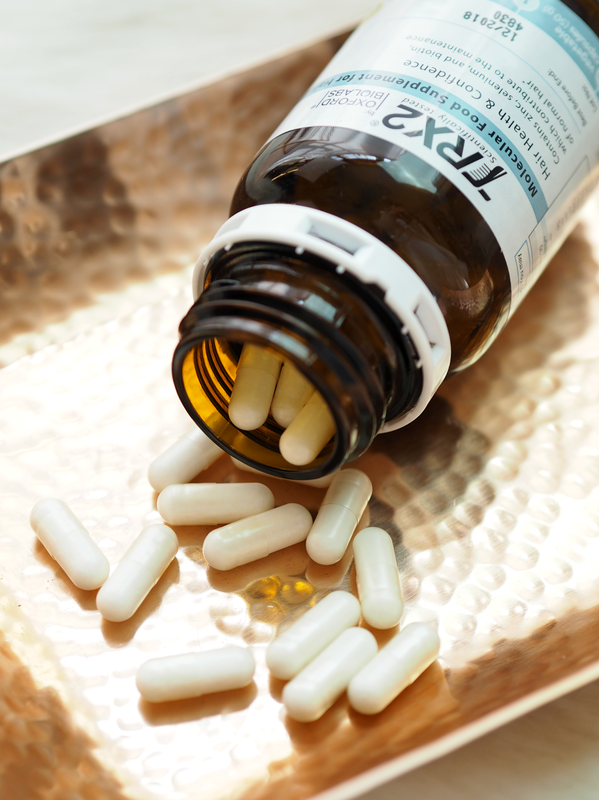 The system involves a topical solution and a supplement to be taken daily, which together can provide results from both the inside and outside; the result is a healthy and fuller head of hair in as little as twelve weeks. If you’re interested in the science bit, then each hair follicle contains potassium channels – small pore-forming protein structures through which vital nutrients are transported to the hair follicle membrane. Over time these begin to wear out, gradually inhibiting the transport of essential nutrients that encourage healthy hair growth; the result is thinner and more fragile hair. TRX2 cleverly works by re-activating tired and clogged up potassium channels so they’re able to absorb essential nutrients and support the production of strong, healthy hair. 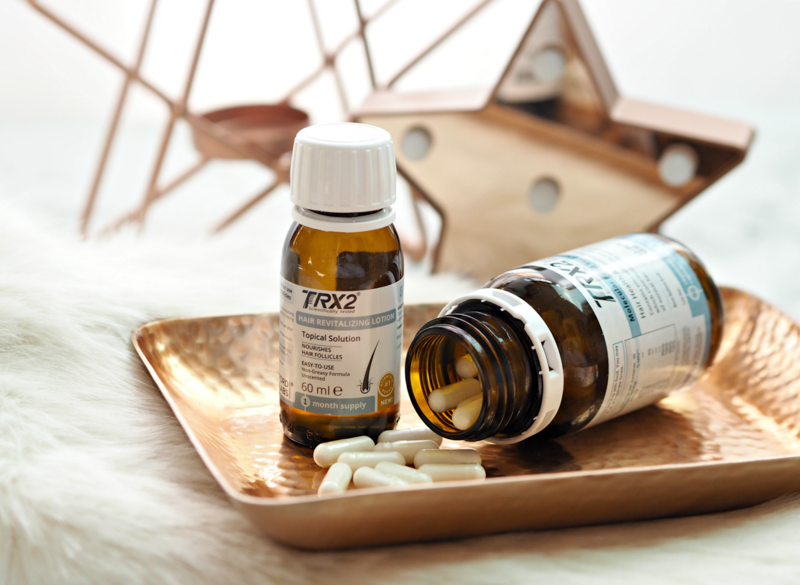 Suitable for vegetarians and free from artificial colours, gluten and preservatives, TRX2 is also drug-free, meaning unwanted side-effects are limited.Although it looks super clinical, it’s an incredibly easy way to manage thinning hair (for optimum results just take three supplements a day with food, and massage in a few drops of the lightweight non-greasy serum to the scalp twice a day) and is full of goodness that our bodies need. As hair thinning is such a misunderstood and rather taboo topic, I want to give ten readers the chance to put this double-whammy solution to the test over the next six months – to see how much of a difference it could make to you, and your confidence levels. If you’re interested in trialing TRX2 over the coming months and sharing your progress with me, then simply fill in the form below and we’ll pick ten readers to undertake the trial. (Applications close midnight 9th April 2017.) Having seen some of the incredible ‘before and after’ photos online, I’ve no doubt this simple solution can make a big difference to some of you suffering in silence. Discover their Facebook page, follow them on Twitter and Instagram. This is a sponsored post on behalf of TRX2; all opinions are my own. By agreeing to be part of the trial you’re committing to using the product daily for a duration of up to six months; you’re also agreeing to document your progress and answer bi-monthly questionnaires, and for your responses to be used within a future blog post as well as within marketing material. All responses are anonymous and full names will not be published. Next Post Can Airbrushing Your Foundation On Really Provide A Superior Finish? It's a vicious circle. I've heard from many people that they've found things that have worked for them, but I guess it depends on the severity. On the website for TRX2 there are some before/after pics which are worth a look at if you're intrigued. I've got really thin hair that I'm a bit self concious about and nothing has really helped me, so I'm going to give this a try and see if it can. Hi Hayley, I need these so much!! Is this open worldwide or U.K. Only? Fingers crossed in Canada! I have entered to trial these for 6 months. I have PCOS (Ovarian cysts) and as a result my hair has been really thinning a lot since the age of 23. I have to use Keratin powder on my scalp each day to cover up any areas that are patchy and where my scalp shows through more, I can never wear my hair down as a result and it is always clipped up. It really does get me down and I don't enjoy socialising because everyone looks amazing and I look casual as I can't do anything with my hair �� i have tried other hair vitamins in the past which have been good for loss of hair but never really made a difference with the thinning so would be really interested to see if these work.